Pro-Israel group helps raise half a million dollars for Senator Bob Menendez, one of the few Democrats to oppose Iran nuclear deal. 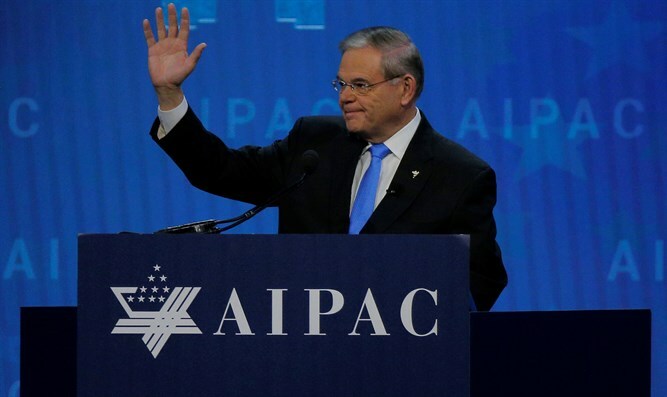 A leading pro-Israel political action committee says it has helped raise over $500,000 for Sen. Robert Menendez, D-N.J., a pro-Israel leader in the Senate who is in an unexpectedly tight race. NORPAC’s all-out push for Menendez this election cycle is notable because Republicans currently lead in the Senate by just 50-49 and Democrats hope to wrest it from them in November, along with the U.S. House of Representatives. President Donald Trump is warning supporters that a Democratic win in either chamber could scuttle his agenda. The most recent NORPAC fundraiser for Menendez was on Monday, at $1,000 a plate. As a PAC, NORPAC may not give more than $10,000 to a candidate in an election season, but it may organize fundraisers where donors cut individual checks and hand them straight to the campaign. The maximum individual donation is $2,700. Corporate executive Bob Hugin, the Republican nominee for Senate in the state, is running an unexpectedly close race in blue New Jersey, within single digits of Menendez in the polls.